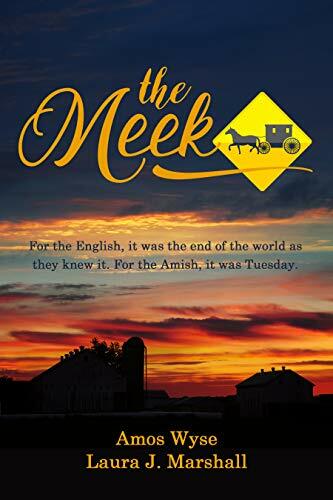 Today I am reviewing the Meek, a new Amish Romantic Suspense novel by Amos Wyse & Laura J Marshall. For the English, it was the end of the world as they knew it. For the Amish, it was Tuesday. Jedediah Wenger lost his family to an Englishe drunk driver. He has yet to put his life back together including the long-forgotten courting of the Bishop’s daughter, Felicity Troyer. When he’s suddenly faced with the task of helping the fading mid-western town of Prosperity survive, he realizes the task is greater than the town or the District can overcome. Hearing about Prosperity through a ragtag ham radio, the remnants of the Government sends U.S. Cavalry Captain Jimmy Flanagan to protect the town which has evolved into a symbol of hope for all of America. His nagging concerns about his family in Nebraska keep him restless where he would otherwise find contentment. As I’ve previously said, I am a huge fan of Amos Wyse & Laura J Marshall… who have a new Amish Romantic Suspense out — and it’s truly amazing! Jedidiah Wenger is an awesome young man who, after losing his parents and siblings, hires three couples to help him with the harvest and the canning of food he’ll need to get through the winter. He has no idea early one morning when he sees the sky light up with flashes of what he believes to be lightning, that the English world is forever changed. I love how the authors did such thorough research that I found myself deeply involved in the story. The characters are realistic, the action is more than enough to hold your interest and the ending… well, you’ll see (if you read it). There’s so much more I could tell you, but I’d really rather encourage you to read the Meek for yourself. If you enjoy Amish suspense novels, you’ll love this new story by these amazing authors!